للمسافرين الذين يرغبون أن يعيشو كل ما تقدمه بيشوورث, Beechworth On Bridge Luxury Motel هو الخيار الأمثل. يمكن من هنا للضيوف الاستمتاع بسهولة الوصول إلى كل ما تقدمه هذه المدينة النابضة بالحياة. يشكل هذا الفندق ملاذاَ مريحاً للاسترخاء ويمنح زواره فرصة للاستجمام والتجدد، وهو يقع على بعد خطوات من المعالم السياحية الكثيرة للمدينة كمثل: Quercus Community Book Shop, ‪Beechworth Honey Experience‬, ‪Beechworth Telegraph Station‬. استمتع بالخدمات الراقية والضيافة التي لا مثيل لها بهذا الفندق في بيشوورث. يقدم الفندق خدمة الغرف على مدار الساعة, واي فاي مجاني في جميع الغرف, واي فاي في المناطق العامة, صف السيارات, خدمة الغرف لضمان الراحة القصوى لضيوفه. في الفندق غرف نوم يتجاوز عددها 14، كلها مجهزة بعناية وجمال وبعضها مزود بـ تلفزيون بشاشة مسطحة, اتصال لاسلكي بالإنترنت, اتصال لاسلكي بشبكة الإنترنت (مجاني), غرف لغير المدخنين, مكيف هواء. يقدم الفندق مجموعة رائعة من الخدمات كمثل حديقة، لجعل إقامتك تجربة لا تنسى. 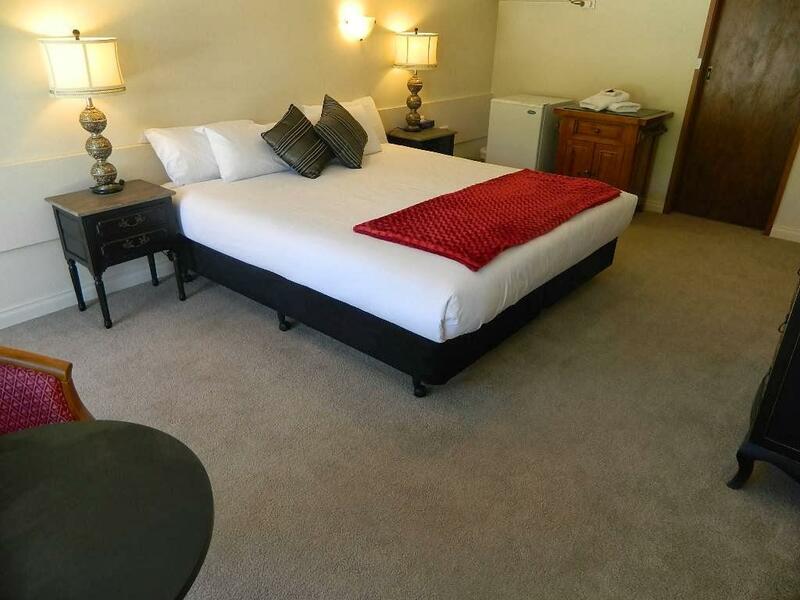 يشكل Beechworth On Bridge Luxury Motel بخدماته الراقية وموقعه الممتاز، قاعدة مثالية للاستمتاع بإقامتك في بيشوورث. Breakfast, biscuits to go with your cuppa and the air conditioning on to warm your room all made the service more personal and relaxing. We had a great visit in Beechworth and enjoyed our stay at the Beechworth on Bridge. The room was large and dark (a big plus when travelling with small kids during summer). We didn’t use the pool but it looked lovely. And the complimentary breakfast was a great addition, saving us time and money in the morning. We thoroughly enjoyed our stay. The lady owner/manager was very friendly and helpful. Lovely, quiet motel in delightful garden setting. Comfortable outdoor seating and bbq's available. We are happy to recommend this motel to anyone looking to stay in Beechworth. Extremely pleasant. Couldn't fault it in any way. Hands down the most comfortable hotel bed I have ever slept in. The staff were helpful and the room was clean. Excellent service, really clean room and all the little extras you like in motel. Stayed at Beechworth on Bridge for a work visit to the area. On arrival, Brenda was very friendly and check-in was very quick. The rooms were a great size and had everything that wa needed, included a few little extra touches. Torch in the bathroom, make up wipes, pack of arnotts biscuits, spare blankets, dvd, microwave, large fridge. We had a very pleasant time exploring the town and the wider area. Milawa is close by providing great choice in dining and the history of the gold mining days is very interesting. The town has much to offer as well, with several good cafes and great museum and Beechworth Honey display as a bonus. I liked the location close to wine regions, shops, restaurants and even a short drive to the border of NSW. The staff were friendly and very helpful. Room was clean and cosy, bed was comfortable, I liked the touch of the coffee machine which makes a decent cup (better than instant for sure), and a good accompaniment to a pleasantly tasty breakfast. The weather was hot during our stay, however, the unit was very comfortable we were able to relax as the air conditioner worked quietly and efficiently. The extras, included WIFI, a capsule expresso coffee machine, fresh milk, a full packet of shortbread biscuits plus the usual toiletries. The shower had good pressure and it was easy to control water temperature. The only extra we might have appreciated was Foxtel. Everything was as expected, good value, comfortable room although we were surprised that the room wasn't fully serviced during our three night stay. It was great. Would stay there again. Lots of places to visit from this location. Easy access, good parking and quite location. Very relaxing and enjoyable. Wouls definitly stay there again. Great. Central to so many places of interest in the north east of Victoria. Would stay there again.